Gladinet Cloud Server is part of the Gladinet Team Edition and Gladinet Enterprise Edition. One of the primary functionality of the Gladinet Cloud Server is to seamlessly migrate your existing file server network share to cloud. Gladinet Cloud Server allows you to attach File Server Network Share to cloud. Once it is attached, it will be synchronized to cloud storage service in the background. In the meanwhile, the file server content can be immediately assigned to a team folder, allowing remote users immediate access. First you will acquire a Gladinet Team account or Gladinet Enterprise server. After that, the company IT staff will install Gladinet Cloud Server on the file server that needs to share files and folders. 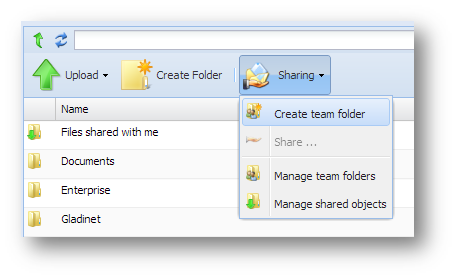 After that, folders locally on the file server can be attached to Gladinet Cloud, within the company account.